I cannot help but feel intimidated when I start browsing the web in search of healthy recipes. There is a tidal wave of information out there. When I read through articles, I cannot fend off the feeling I am doing something wrong or not enough. Somehow, I never seem to be able to eat enough vegetables and fruits. Somehow, my appetite does not conform to the never-ending lists of super foods you should consume. Somehow, I feel being torn between the urge to eat healthy and the need not to indulge in naughty pleasures. Fundamentally, I believe in home cooking without spending the full day in the kitchen or doing shopping. Although I might slip and indulge in naughty stuff from the supermarket, I continuously enlarge my repertoire of dishes that put the right kind of food into our bodies. One of them is this layered beetroot salad. It is loaded with nutritional goodness. 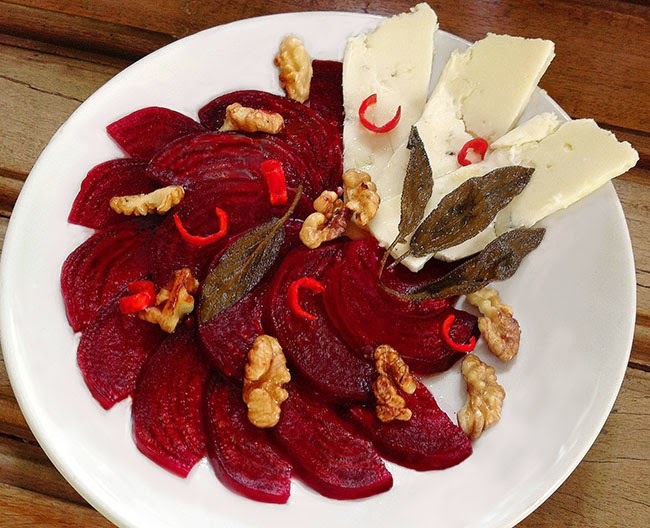 Beetroot and walnuts regularly feature in the many lists of super foods. Sage is known for its benefits, and at this point most of us know the virtues of olive oil. Blue cheese may be an acquired taste for some. If you don’t like it, exchange it for any other cheese or simply skip it. However, I discovered a new study. According to its findings, you should make blue cheese a regular addition to your diet if you like the taste. Thanks to the proteins of the cheese, this salad makes an excellent starter for a festive menu and is a complete light meal by itself. I present it in layers because it looks a lot nicer than mixing all the ingredients together. Boil the beetroots until they are tender. I use a pressure cooker for this purpose. Place the beetroots into the pot, cover them with water, add salt and cook them for half an hour after the first whistle. In a normal pot they take about three times as long. 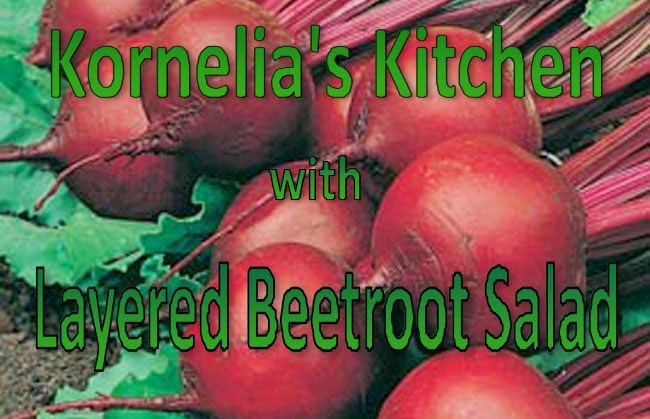 Beetroots are cooked when the skin comes off easily. Let the beetroots cool down, then peel and slice them. Carefully slice the blue cheese and keep aside. I used Gorgonzola made in Auroville, which I can recommend. However, any blue cheese will do. If you don’t like blue cheese, take any other cheese. I have to say, the contrast between the tender sweetness of the beetroots and the tangy, rich saltiness of the blue cheese combined with crunchy toasted walnuts makes this salad so attractive for me. Take a small pan and roast the walnuts carefully over a small fire. When roasting nuts, you have to watch them. Roasting turns easily into burning when the process is left unattended. Place the roasted walnuts on a plate for later use. Pour the vinegar into a vessel. Add about one teaspoon of salt and pepper according to your taste. Wash the chillies and chop them finely. The bright red adds a nice colour contrast to the purple beetroots. If you want your salad spicy, keep the seeds. For a milder zing remove the seeds. Peel the garlic cloves. Spread about three tablespoons olive oil into the pan you used for toasting the walnuts. Add the garlic cloves to infuse the oil. Turn on the heat. When the oil is hot, add the sage leaves and fry them until crispy. Spread them on a kitchen towel to drain excess oil. These crispy sage leaves add another texture and layer of taste to the salad. However, they don’t stay crispy long so you need to do this shortly before serving the salad. If you don’t want go to this trouble, skip it. The salad is nice also without crispy fried leaves. Finally, it is time to assemble the salad. Add the remaining olive oil and the garlic infused oil from the pan to the vinegar and stir well. Layer the beetroots and the blue cheese on the plates. Sprinkle the toasted walnuts, the chillies and the crispy sage leaves over the vegetables and the cheese. Spread the vinaigrette over all the ingredients. There should be enough dressing on the plates to coat every beetroot slice. Enjoy!